This month, we’re keeping in theme with 2017’s National Simultaneous Storytime book, The Cow Tripped over the Moon. 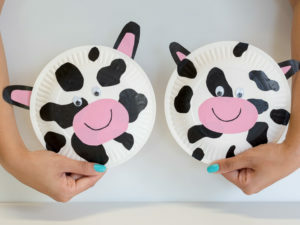 Here’s an easy, fun, and engaging cow-related activity the kids are sure to love. To get started, begin by cutting the black paper for the cow’s spots. Keeping in mind that no two spots are the same, it gives children the freedom to cut them however they like. This activity is perfect for preschoolers learning to use scissors. Once cut, stick them onto the back of the plate to resemble a cow’s face. Next, cut out two black ovals and stick them behind either side of the plate, to make the ears. You can even cut out and stick tinier pink ovals to add more detail. For the nose, simply cut and paste a piece of pink paper in an oval shape. Your child can also draw a smiley on it, if preferred. Finally, stick the googly eyes above the nose. Your paper plate cow is ready!